The next provincial election is not until May, but those vying for seats in the legislature are coming out of the woodwork in both of Kamloops’ electoral districts. Currently in place representing Kamloops are B.C. Liberals Todd Stone (Kamloops–South Thompson) and Terry Lake (Kamloops–North Thompson). Both are cabinet ministers, in transportation and health respectively. Stone is seeking re-election in the South Thompson, but the B.C. Liberal candidacy is up for grabs with Lake’s announcement in August that he will not seek another term. Three people seek the nomination in that riding: Kamloops Mayor Peter Milobar, developer Michael Grenier, and Steven Puhallo, executive director of the North Shore Business Improvement Association. The other parties are turning their gears towards election season too, with TRU co-op coordinator and former city councillor Nancy Bepple seeking the nomination for the B.C. NDP in the South Thompson. When discussing post-secondary education, Bepple said she was “distressed” by funding cuts to programs, particularly to the Adult Basic Education (ABE) program which allowed adults to earn their high school diploma and take courses to prepare for undergraduate programs tuition-free. In 2015, under the B.C. Liberals, the system changed so that students who already have a high school diploma must pay tuition on their upgrading courses. “It puts up a barrier to people who probably need the most opportunities for education. In terms of their future, if they’re the least educated, they are probably the least employed and the least paid,” Bepple said, adding that she believes TRU needs to add more programming that supports the local economy and communities. Retired teacher Lillian Kwan has also announced that she is seeking the B.C. NDP nomination in the South Thompson, though she made that announcement after the deadline for this article. Barb Nederpel, president of the Kamloops and District Labour Council and the B.C. NDP candidate in the North Thompson, wants to provide additional funding to post-secondary education in B.C., and would like to see a return of need-based student grants. “It’s shocking that B.C. 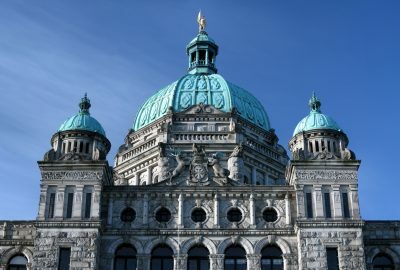 is the only province that does not offer grants based on financial need,” Nederpel said in an email, also adding that she believes it is unethical that the B.C. Liberals are charging interest on B.C. student loans once students leave school. City councillor Donovan Cavers is seeking the Green nomination in the South Thompson. “We are looking to any places that can help make the changes we’re making,” Hines said, adding that he believes the Greens are the party that are taking the shift to a decarbonized economy most seriously. The Communist Party of B.C. is running candidates in Kamloops, as well. Peter Kerek and Beat Klossner are candidates for the north and south respectively. Klossner, a local baker at Swiss Pastries downtown, told The Omega that he would demand that tuition fees be abolished, universities be fully publicly funded, and would end corporate involvement in the system. “Education has been underfunded by the Liberal and NDP governments for decades and the trend is towards privatization,” Klossner said in an email, claiming that if corporate taxes were restored to 2001 levels, it would give the province $2.5 billion in extra revenue that could be used for post-secondary education. The potential B.C. Liberal candidates in the North Thompson refused to comment before the candidate selection meeting on Nov. 19, though Puhallo did say that he has always been a strong advocate for growing TRU. Cavers, Stone and Kerek also did not respond to requests for comment.